Bought a MacBook Air (Middle 2011) - 11inch, US Keyboard, 4GB Memory, 128GB SSD and Core i7 - to replace my MacBook (Early 2008) that has served me very hard as a Vine Linux development environment as a daily basis for a few years. To be honest, I always have used my whity MacBook with Vine - Mac OS X is always there on the harddrive in a separated partition, but I seldom booted it up on my MacBook - maybe once or twice a year? Another OSX machine at home, an old PowerMac G4 MDD, is still there and serving me as a daily basis as well, to store my huge digital music contents (almost all in lossless format) on iTunes (still hundreds of CDs left to get ripped though), and as a scanning machine (connected to the old SCSI A3 flatbed scanner). The first thing I did on my new toy was to play around the new OS for a while that amazed me a bit. This was the first time for me to play with the multi-touch trackpad and gestures. I felt Gestures and "Mission Control" are really great for portable computers with small screens like this MBA 11inch. And the next thing I gonna do was, of course, to figure out how well this brand new machine is supported on Linux - I know there are so much to get done on the Linux kernel, the X thing, and some userland utilities, to run Linux on the MBA 2011 flawlessly, but I just thought it was worth checking out and playing around. 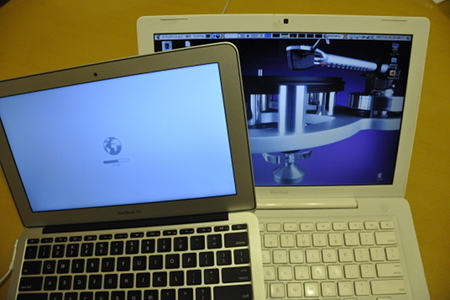 Continue reading Installing Vine Linux on MacBook Air (Middle 2011). * @param pvUser2           The notification event. * @remarks This can be invoked in interrupt context. Now the fix has been included on VirtualBox-4.1.0-2vl7 (VineSeed). Same fix for Vine Linux 6 (more precisely, packages for VinePlus/6) will be uploaded as 4.1.0-2vl6 as well shortly.